Making sushi is an art. But we firmly believe you too can be an artist. Learn it once, enjoy it always! Making great sushi is not hard to learn. All it takes is some time, an eye for detail, the right tools and ingredients, and most of all: love for sushi. 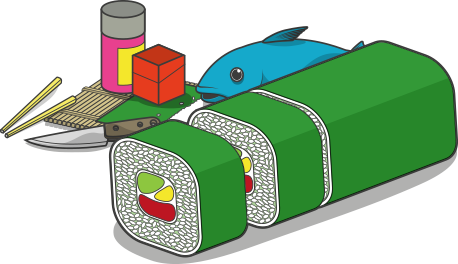 So take a look at the recipes, watch our instructional videos, buy the ingredients and start making your own delicious sushi! In this video chef Devaux shows how to make eggs benedict 2 very different ways, first he shows the basics of making eggs benedict; a simple wine reduction and clarified butter. Then moves on to show the traditional way to make eggs benedict with standard cooking equipment which you can find in any kitchen and finishes by showing a professional way to make eggs benedict using slightly more exotic cooking equipment like a sous-vide machine and a culinary iSi siphon. This video shows how to make a new kind of sushi roll, one that has two faces, on one side it looks like a normal salmon maki sushi roll but when you flip it over you see a maki sushi roll with spirals of colored sushi rice. In this video tutorial Chef.Devaux shows how to make a beautiful but simple decorative garnish using only a simple cucumber. In this video recipe Chef Devaux shows how to make a steak tataki inspired sushi roll. In this video tutorial Chef Devaux shows how to very simply make a rose garnish by carving a tomato in a very simple way. Although this is a very simple garnish to make it is very pretty and will make your food stand out. The roll is made with snow crab and ginger salsa, this tasty filling is wrapped in nori and perfectly cooked sushi rice topped with precisely cut avocado and a little bit of spicy mayo and masago as decoration. The sushi roll pieces are then presented on a large wooden platter with other eye appealing garnishes like the cucumber whale and a wasabi flower. Get the basics right. Learn how to make sushi rolls like a sushi chef. Have you got the right tools and ingredients? Stay up to date with the latest recipes, join us and share your experiences, recipes and videos with your friends, colleagues and like-minded sushi fans. ©2017 Make Sushi. All Rights Reserved.